What happens when the rousing energies of two eclectic, experimental and outlier sounding musicians rub off each other in an era where afrobeats and trap music are all the rave? Sena Dagadu and Worlasi provide an answer with their first collaborative body of work – work that quite literally flies audiences into new dimensions in a sonic spaceship! Aptly titled Wings, the project delivers a musical experience unlike anything for miles out there. Wings, the EPThe project blends Sena’s electronic, gypsy sounds with her powerful, no-nonsense rawness together with Worlasi’s hopeful, trance-like vocals to deliver a fun EP about positivity and freedom – freedom to believe in yourself, freedom to let go of naysayers holding you back, freedom to have fun, freedom to take flight and just be the best possible version of yourself! Wings is a 9-track EP nearly 2 years in the making. First catching a vibe working together on One Life back in 2017, the two artistes started feeding off each other’s energies. According to Hungarian-based Sena, she knew they’d always work on something together, it was just natural. The question was when? Sena, who produces most of her own music had unconsciously already designed the soundscape for the EP. Fast forward to Worlasi’s Hungarian tour a year later, the two rode their creative waves in Sena’s home studio, laid their vocals and thus birthed this fresh EP. This EP is Sena Dagadu and Worlasi’s gift to the world, a gift that spreads nothing but positive energy. A gift that encourages you to let go of your inhibitions, to bathe your soul and body in joy, to unfurl your wings and take off! 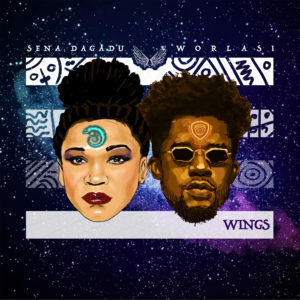 Wings the EP is mostly Worlasi and Sena Dagadu with one feature from M3NSA.